James Tate, Pulitzer Prize winner, and MFA faculty said, “Charles Wright lives in a world of stars and stags and butterflies, then there are the streams and there is the long-gone past. So what’s a poet going to do? Fall down and worship, or just keep walking on? 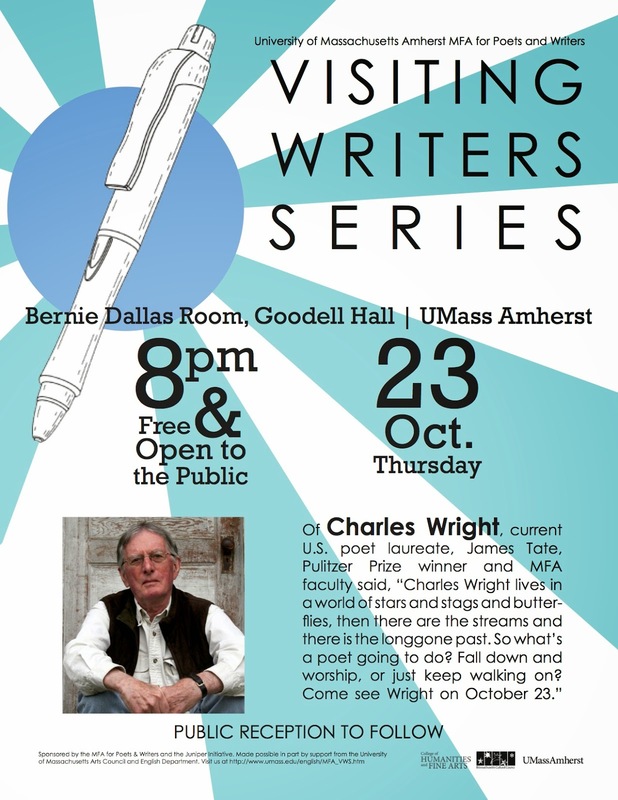 Come see Wright on October 23.” The MFA for Poets and Writers is proud to bring such a prolific American voice to campus. Mr. Wright is the author of 24 poetry collections, two books of essays, and three books of translation. His honors include the Pulitzer Prize, National Book Award, National Book Critics Circle Award, Bollingen Prize, Ruth Lilly Prize from the Poetry Foundation, and the International Griffin Poetry Prize, as well as the 2008 Rebekah Johnson Bobbitt National Prize in Poetry from the Library of Congress. Most recently, Mr. Wright published the collection Caribou (2014), which Publishers Weekly describes as "a dexterous balance of lightness in dark . . . rife with nihilism, humor, and beauty." Mr. Wright’s reading is part of the MFA program’s Visiting Writers Series. Celebrating its fifty-first year, the nationally renowned Visiting Writers Series at UMass Amherst presents emerging and established writers of poetry, fiction and non-fiction. The Series is sponsored by the MFA for Poets and Writers and the Juniper Initiative, and made possible by support from the Massachusetts Cultural Council, the University of Massachusetts Arts Council, the College of Humanities & Fine Arts, and the English Department. The reading is free and open to the public. For more information, please visit www.umass.edu/English/MFA_VWS.htm.